Saturday, January 28, 2017 9:00 AM Place 5 Points 16 Meet Recap The Odem Owl Boys Power Lifting team traveled to Yorktown, Texas for their third invitational meet of the season. Results are as Follows: Tevin Moreno placed 2nd in the 198lbs weight class, followed by Orlando Gonzalez who placed 3rd in the same class. 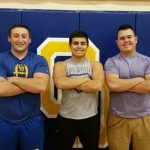 Dante Pizana, Estevan Esqueda, and Tristian Frerich qualified for the Regional Powerlifting Meet to be held this Saturday, March 12th at Bishop High School. Dante is currently 6th in the 165lbs weight class. Estevan is currently 8th and Frerich is 11th in the 242lb weight class.